This not a picture of a carpet cleaning. Instead we took a picture of the waste from a carpet cleaning in Tampa FL. 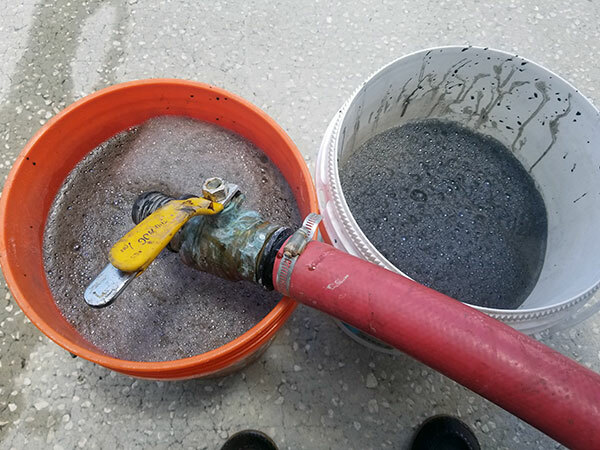 One of the real problems for home owners and businesses in Tampa FL is the amount of sand that accumulates in the carpet fibers. Tampa sand is extremely fine and makes it's way into homes and businesses everyday. Even with a high performance vacuum cleaner you can't remove the soil build up in the carpet. We took this picture at the end of a typical carpet cleaning route. The waste water is heavily soiled and quite dark from the debris that was removed during the cleanings. We have customers everyday who ask "Was my carpet/upholstery very dirty?" The answer is always "Yes." There is really no good way to prevent soil build up in carpets. We have noticed that home owners who have a no shoes policy in their home have cleaner carpets as a whole but regular professional carpet cleaning is your best bet at keeping your carpet clean. This begs the question "How often should you have your carpets cleaned?" Carpet manufacturers recommend having your carpets cleaned once a year. Some require it to maintain a carpet warranty. If you have a lot of traffic in your home, via a large family or pets, we recommend having it cleaned every 6 to 9 months to maintain a healthy carpet. If you in need of a good carpet cleaning in Tampa FL do your research and stay away from extremely cheap carpet cleaning deals.